‘ To be a good photographer you don’t need great skill. All you need is a good camera’ commented Mamta some time back. I don’t agree to that. To start with, I don’t consider myself a good photographer. Photography is difficult. Not all photographs speak 1000 words, but a few speak a million. A good photographer is one who is consistently able to make photographs that speak a few thousand words. A video is much easier that way, and a documentary (or audio-visual) is further so (once you have a story, you know what content you need. You just have to go out and shoot that). But in photography, you are handicapped without the extra dimension of time to describe the scene. More so if your dimensions of expression is shunted further, without color. Here’s an attempt at Black and White photography. 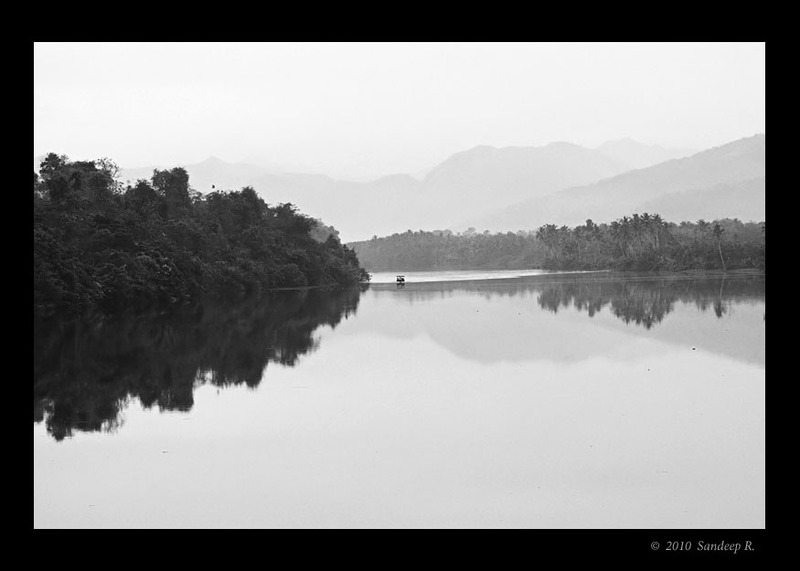 Landscape of Periyar river, captured at Thattekad in January. The misty morning and the dense forest vegetation provide the beautiful contrast. Also, an example of landscape images you can make on Canon 100-400. 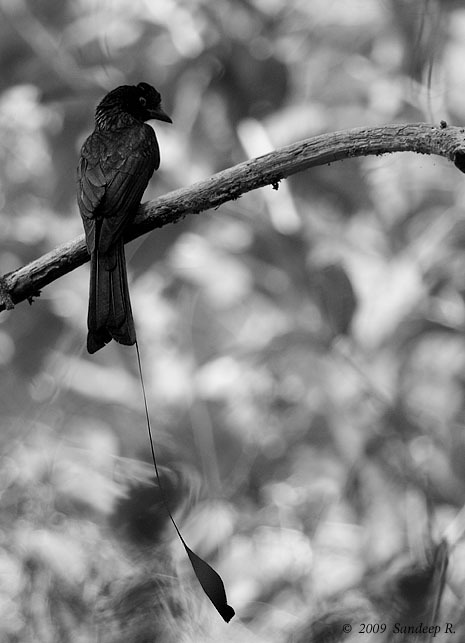 Greater Racket-Tailed Drongo at Thattekad in the yellow and green canopy. This one has lost one of it’s ‘racket tail’. Finally, the pride of India walking into history. 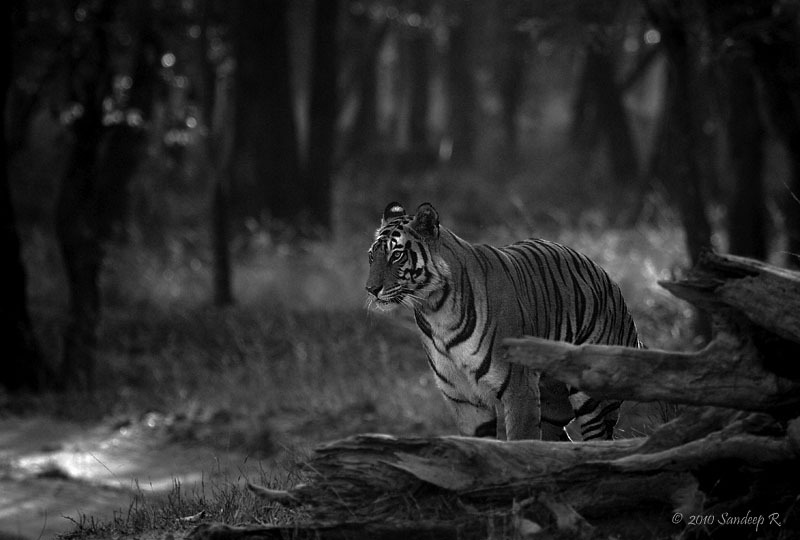 Photographed at Magdhi zone, Bandhavgarh national park. I have felt Black and White photography is much harder than color photography and am looking for materials to learn about capturing and processing grayscale images. Please point to any good material about Black and White photography. Here’s a good article on Black and White photography from Naturescapes. Why I choose Canon 100-400mm IS lens? The answer is not a very straight forward one. I did quite a bit of research before I choose the lens that suits my requirement. You can find a brief comparison (or the options I had) of super telephoto lenses under $1500 for bird photography here. I am writing this after nearly 10 months of using this lens. I am convinced now that my decision was right. I choose Canon 100-400mm f/4.5-5.6 IS USM over Canon 400mm f/5.6L USM prime (mostly for IS) and over Canon 300mm f/4L IS USM + 1.4x TC combo (for flexibility of zoom). I had considered Sigma 150-500mm OS and couple of other Sigma lenses as well. I decided on Canon 100-400mm f/4.5-5.6L IS USM after considering the hand holding ease, price, Image Stabilization (IS), flexibility, sharpness and image quality. From my experience, Image quality of all these three ‘L’ lenses are very much the same. Though they say prime is better, in the field under practical circumstances, it doesn’t make noticeable difference (unless used with a teleconverter# perhaps). I decided against Sigma 150-500 because (i) it is much heavier and (ii) the image quality at 500mm was not better than Canon 400mm prime or 100-400mm @ 400mm extrapolated to 500mm. Also, aperture at f/6.3 of Sigma at 500mm is a factor to consider. Sharpness of the lens varies from copy to copy (one 400 prime might be sharper than another 400 prime, and it’s very much possible to have a copy of 100-400 sharper than 400 prime). It depends on the copy you get. The sharpness difference could possibly be for the test freaks and/or professional reviewers, who put the lenses on a sturdy tripod with IS off and focus on a test pattern to judge the sharpness. Even basic post-processing will diminish the subtle difference in sharpness among the 3 lenses, considering that all the 3 lens copies are the best (or sharpest). Sharpness also depends on the AF capability of your camera body. So for all practical purposes, in field, sharpness of all these three lenses are the same. Since I photograph mostly hand held, Image Stabilization (IS) and ease of hand holding was an important factor. 400 prime is much lighter than 100-400 or 300 + 1.4x TC. But lack of IS doesn’t give as sharp an image at 1/150s-1/200s (yes, I don’t have a very sturdy hand). Also, the locations I photograph birds don’t have very good lighting all through the year. I have experienced that carrying a tripod, when on foot, for a reach of 400mm will scary away birds. So, the choice was between 100-400 and 300 f/4 + 1.4x TC for IS. The price difference between the two (100-400 and 300 + TC) is not very significant (but 400 prime is cheaper). Although I predominantly photograph birds, I photograph mammals as well. I cannot afford another specialized lens such as 70-200mm f/2.8L for mammals. On my last weekend trip to Bandipur, tigress Gowri came out right next to the jeep I was in. I pulled back the zoom from 400mm to about 150 or 200mm and fitted her in the frame. A few minutes earlier, I had stretched it to 400mm for photographing a pair of Streak Throated Woodpeckers. Flexibility of 100-400 out weighs that of 300 f/4 + 1.4x TC combo (or even 400mm prime). I shoot mammals as well as birds. So, having a flexible zoom was more important. Also, it’s possible to compose some good landscape images at 100mm. In my opinion, Canon 100-400mm IS USM without doubt is ‘the best wildlife lens’. If you want to photograph only birds then 300 f/4 + 1.4x TC might be a better choice with some reservations*. 400 prime comes cheaper and has faster AF than 300 + TC. If you are shooting in good lighting conditions most of the time, it makes sense to buy the 400 prime. IS doesn’t play big role in good lighting conditions. Also, if you have shelled out a lot of money on a good DLSR with better noise performance at higher ISO, you don’t need to think of IS. Having IS is of no use if you are after birds in flight. 400 prime is proven to be the best for BIF. I was initially tilted towards 400mm prime, for it’s supposedly faster AF and better IQ. But when I tried out 100-400 and 400mm prime on a 1D MIII (with and without tripod) at Canon Image Lounge, I was more impressed with the zoom. # With Teleconverters, Prime lenses are known to perform better wrt auto focus, and also give better image quality with a TC. Canon 400mm prime lens when used with a 1.4x TC and taped pins on a non-pro Canon body is known to perform better than 100-400 with a TC and taped pins. I’d exclude more details on this in the current post. If anyone interested, i’ll write more with an update. Hope you make a choice that’s suitable for you. Here I present a few photographs, definitely not the best this lens can produce but a good indicative of its capabilities in terms of Image quality, Sharpness, Colors and Contrast, and AF capability. 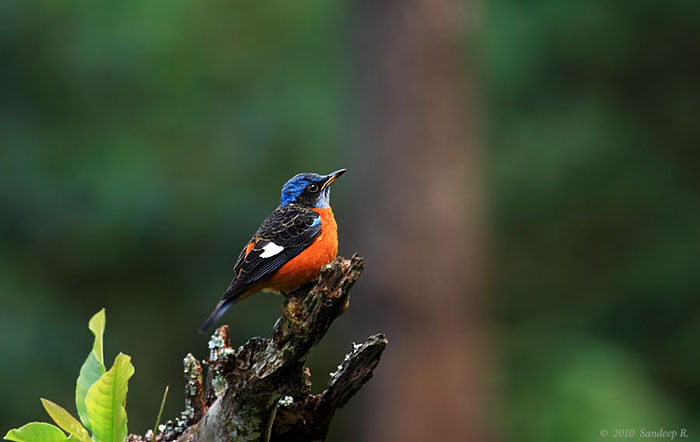 Here’s an image of a Blue-capped Rock Thrush (at Kgudi / BR Hills) that I shot hand held, with support of jeep, at 1/13 second shutter speed on Canon 450D and 100-400mm IS lens. This shows the use of IS and low light AF performance of this lens. This image of a juvenile Brahminy Kite trying to catch a fish at Hesarghatta Lake. 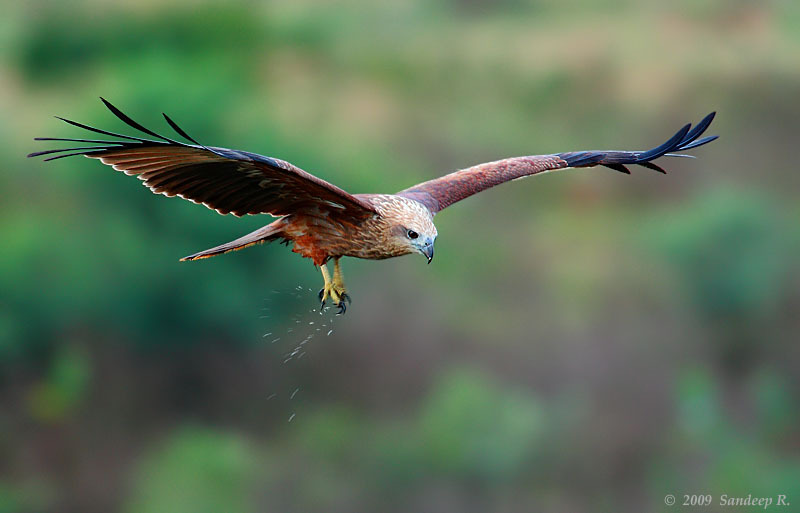 Image captured at a reasonably faster shutter speed of 1/160s, shows the capability of AF for in flight shots. 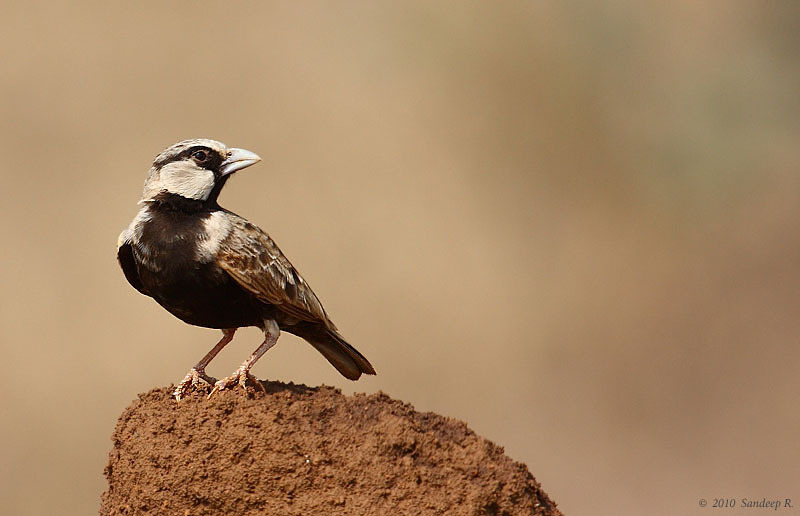 Finally, an image of Ashy Crowned Sparrow Lark at Hesarghatta Lake. Aperture f/8 and shutter speed of 1/640s. I don’t have to say more.